Question: Why is Eleanor Roosevelt often called the "reluctant first lady?" Eleanor Roosevelt did not want to be first lady, and the press recognized it. She had worked very hard to build her own career, develop her own personal and professional circle, and loved teaching at the Todhunter School. Her earlier experiences in Washington, as an assistant secretary=s wife and the president=s niece, showed her how cold, calculating, and isolating life could be in the nation=s capital. ER made news throughout the 1932 campaign when she told the press that she planned to do more than serve as White House hostess. On July 4th, the Associated Press declared "Eleanor Roosevelt Would Scrap Outworn Social Traditions: Can't Imagine Being Absorbed by Drawing Room Duties, Wife of Nominee Declares." The Washington Star followed suit, proclaiming that "Mrs. Roosevelt Would Scrap Outworn Social Traditions." By October, the image of "Eleanor Roosevelt: Tireless Worker" spilled across seven columns of a North American News Alliance wire release. ER spent election night in conflict. Although she "was happy for my husband" that evening, she felt "more deeply troubled" than her close friends knew. She thought her husband's victory "meant the end of any personal life of my own." She knew what would be expected of her. "I had watched Mrs. Theodore Roosevelt and had seen what it meant to be the wife of a president, and I cannot say that I was pleased at the prospect." Her career had given her a "certain amount of financial independence," which she "enjoyed" because she "had been able to do things in which I was personally interested." She went to bed with great "turmoil in my heart and mind" and the fear that "the next few months were not to make any clearer what the road ahead would be." ER admitted to Hickok that she would "curtail somewhat her activities" but she refused to stop all of them. Aware of the criticism her position would provoke, she declared that she had no choice but to continue. "I'll just have to go on being myself, as much as I can. I'm just not the sort of person who would be any good at [any] job. I dare say I shall be criticized, whatever I do." Publicly, ER tried to reason with her critics, telling an interviewer that she "really [was] not doing anything that I haven't done for a long time. It's only Franklin's position that has brought them to the attention of the people." She pleaded for a few more weeks of freedom. "I shall drop a good many things when we get to Washington. But . . . we aren't in Washington yet. . . . Until March 4, I hope to be permitted to enjoy the privileges accorded a private citizen." But that did not happen. When ER entered the new year doing "the things she had always done," Hickok reported, "the papers continued to carry stories about her. And some people continued to criticize her. They just could not get used to the idea of her being 'plain, ordinary Eleanor Roosevelt.'" Thirty years later, when Hickok wrote a biography of ER, she titled it Eleanor Roosevelt: Reluctant First Lady. Allida M. Black, Casting Her Own Shadow: Eleanor Roosevelt and the Shaping of Postwar Liberalism (New York: Columbia University Press, 1996), 20-21. 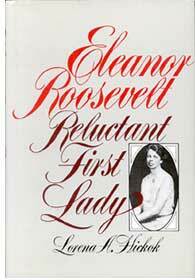 Lorena Hickok, Eleanor Roosevelt: Reluctant First Lady (New York: Dodd Mead, 1962), 3.